Slowing down and reluctance to jump may mean your cat has arthritis. 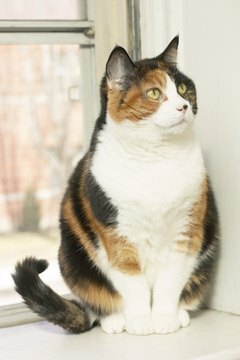 If your kitty suffers from arthritis, your vet may prescribe prednisone to help manage her condition. Although prednisone won't cure your cat's arthritis, it can improve her quality of life, enabling her to cuddle and play again. Consult your vet with concerns about your cat's joint health or medications. If your cat has arthritis, the cartilage that covers the articulating surfaces of some or all of her joints is worn down. This usually happens in response to joint stress or damage, and the disease will progress over time without treatment. Symptoms of severe arthritis in cats generally appear late in life and may include lameness, stiffness, joint swelling, muscle atrophy on the legs, behavioral changes, irritability and a reluctance to run, jump or play. As the disease progresses, your cat's pain, stiffness and loss of mobility will increase. Don't assume your cat has arthritis; only a vet can diagnose and prescribe treatment for your kitty. Prednisone is not a cure for arthritis in cats, but it can bring substantial relief. Prednisone and other glucocorticoid medications treat arthritis by relieving the inflammation that causes swelling, stiffness and pain. In addition to the direct benefits, prednisone helps cats with arthritis indirectly by improving mobility to promote increased activity and weight loss. Prednisone is converted to prednisolone in the liver. Cats are less likely to develop side effects than dogs on prednisone. When side effects do occur, they usually include weight gain, gastrointestinal problems, behavioral changes, frequent urination, increased hunger and increased thirst. Because prednisone suppresses the immune system, your kitty is more likely to develop respiratory and urinary tract infections while undergoing arthritis treatment. Avoid long-term use of prednisone unless there are no other options. If your kitty takes this medication over months or years, she may develop Cushing's syndrome or other complications. To ensure the lowest possible dose is needed for the shortest period of time, prednisone should be used in conjunction with weight loss, non-steroidal anti-inflammatory medications, physical therapy, lifestyle changes and joint supplements as recommended by your vet. It is extremely important to taper your cat off prednisone. Stopping the medication abruptly could lead to serious complications. What Does a Veterinarian Check on in Physical Checkups for Cats? Can Cats Lose Their Meow?